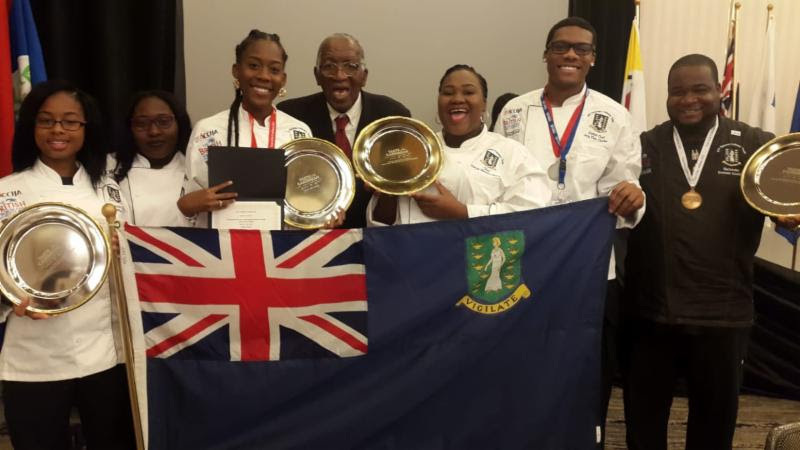 Despite entering as a team with little preparation due to the 2017 hurricanes, the British Virgins Islands was nothing short of exceptional in this year’s regional culinary competition called Taste of the Caribbean. The territory’s culinary team emerged out of the competition with a number of awards. One of the star chefs of the competition was Radiance Modeste, a native of Virgin Gorda and a student of the Virgin Islands School of Technical Studies. Though being the youngest in the culinary competition, 17-year-old Modeste was named ‘overall winner’ in the seafood segment. Another Virgin Gorda resident, Ariq Flax Clarke, demonstrated his skill in the kitchen and earned a silver medal in the Junior Chef of the Year competition. Clarke – a student at Johnson & Wales School of Culinary Arts in North Miami – also received an ‘honourable mention’ in the Certified Angus Beef Competition. His schoolmate, Lakesha Barry, also bagged an honourable mention in the Chocolate Competition. The BVI had also mined a third medal — this time from local bartender Everson Rawlins, who took home the bronze in the Bartender of the Year competition. Taste of the Caribbean is a Caribbean Hotel and Tourism Association (CHTA) event. It was held in Miami from June 22 to 26. The BVI’s Chamber of Commerce and Hotel Association (BVICCHA) is a member of the CHTA and was responsible for assembling the local team and organising its appearance at the competition. BVICCHA Chairman, Louis Potter said his organisation was quite pleased with the territory’s performance in the event. Meanwhile, a media release for the BVI Tourist Board said the BVI had teamed up with other hurricane-affected countries and territories such as Puerto Rico, the USVI and Anguilla to form ‘Team Caribbean Strong’. During the event, Team Caribbean Strong received the Tony Mac Award for Spirit of the Competition. Great guys! We’re proud of you! Kudos Team BVI!!! Well done! Always continue to do your very best. Good job. Congrats Big time!!! Keep up the Great works!!! We are more than qualified on MANY levels, but are made to feel unqualified in our own country by naysayers, but we know better!! Bam! Bam! Bam! Big up u self everson s— i——- can’t stop u,just hold u head up.